Official synopsis: "After surviving an assassination attempt, teenager Michael Asher discovers that he is at the center of a worldwide conspiracy reaching higher than any earthly power. A supernatural organization desperately wants him dead. He doesn't know why. Everyone who might have the answers has already been killed. Tumbling into a web of international secrets, Michael is forced to fight back and dig up the truth. He begins to question how much of the world is truly as people are led to believe it is. Are there things that humanity is not being told? Who is the puppet master? And how far into the maze can he venture before he is lost forever?" Lord, give me strength because this review is going to be a tough one to write! Yikes. How do you even review a book you didn't finish? I pride myself on honest reviews, as do most bloggers out there. So it pains me when I actually don't like a book because I know I'm going to have to say so rather than just say "yay, this was awesome..." because that would be a lie. Okay, so... Harken. Not going to lie, when it was announced I was freakishly excited to read it. I'd never read any of Kaleb's previous works but I had heard a lot of good things about them out there on Twitter. Everything about this sounded amazing. Conspiracy. Supernatural beings. Fancy cars. I was hyped up to the max, it's safe to say. The promotion for the book was amazing, the fact that not a lot was revealed but just enough to pique some interest - the videos revealing the artwork, title, just so cool. It was marketed well and it definitely got people talking. But where Harken fails for me is in itself. I just couldn't find it in myself to continue reading. Yes, there was action but it felt stilted... staged. I just couldn't get into it. After the initial action in the first chapter it just stopped. It stalled. The foot came off the gas and I plundered through several more chapters before in the end I just gave up. Yeah. That's right. I didn't finish Harken. It annoys me, because I hardly ever stop until I've reached the end of a book, but occasionally I guess a book just comes along that doesn't really gel with you and you just can't continue any further. 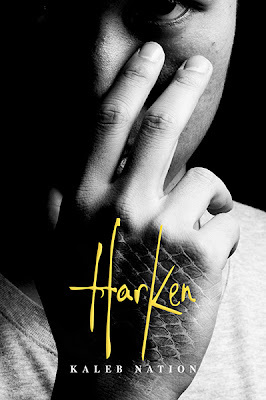 I really wanted to love Harken. I truly did. Like I mentioned earlier, I was so hyped about it's release, so much so that as soon as I'd downloaded it onto my Kindle I cleared my reading pile to the side and started. I didn't particularly take to Michael as a character though. I like cars. Well, some. I'm not that car-y. But Michael seemed almost too fixated on his car being a certain make and the fact that he couldn't really afford it. He seemed materialistic and kind of turned me off a bit in that sense.